© 1998-2015 Bob Hackett, Sander Kingsepp and Peter Cundall. Nagasaki. Laid down at Mitsubishi Shipbuilding as a 9,627 GRT passenger-cargo liner for the Osaka Shosen Kaisha (OSK) Line. Launched and named RIO DE JANEIRO MARU. Completed. RIO DE JANEIRO MARU can accomodate 1,140 passengers. Departs her home port of Kobe on her maiden voyage to OSK's South American ports of call. Arrives at Santos, Brazil on No. 165 Emigrant Voyage. Arrives at Santos, Brazil on No. 171 Emigrant Voyage. Arrives Santos on No. 177 Emigrant Voyage. Arrives at Santos, Brazil on No. 184 Emigrant Voyage. Arrives at Santos, Brazil on No. 194 Emigrant Voyage. Arrives at Santos, Brazil on No. 205 Emigrant Voyage. Arrives Santos on No. 215 Emigrant Voyage. Runs aground in the Mississippi River estuary. Arrives at Santos, Brazil on No. 225 Emigrant Voyage. Arrives Santos on No. 235 Emigrant Voyage. Arrives at Santos, Brazil on No. 244 Emigrant Voyage. Arrives at Santos, Brazil on No. 251 Emigrant Voyage. Arrives at Santos, Brazil on No. 260 Emigrant Voyage. Provides around-the-world service. Ports of call include Yokohama, Hong Kong, Singapore, Colombo, Durban, Cape Town, Rio de Janeiro, Santos, Montevideo, Buenos Aires, Belem, Cristobal, Balboa and Los Angeles. Arrives at Santos, Brazil on No. 271 Emigrant Voyage. Arrives Santos on No. 275 Emigrant Voyage. Arrives at Santos, Brazil on No. 278 Emigrant Voyage. Arrives at Santos, Brazil on No. 282 Emigrant Voyage. Arrives at Santos, Brazil on No. 285 Emigrant Voyage. Departs Kobe on No. 289 Emigrant Voyage. Arrives at Buenos Aires. Then reverse on return voyage. Makes voyage to eastern coast of South America. Departs Kobe on No. 293 Emigrant Voyage. Sails to Kobe then Los Angeles. Collides with KAGU MARU at 46-16N, 177-10E. RIO DE JANEIRO MARU is damaged and KAGU MARU tows the ship. Salvage tug SEIHA MARU subsequently takes over the tow and tows the ship to Mitsubishi Jukogyo’s Kobe yard where the ship is repaired. Kure Navy Yard. Begins conversion to an auxiliary transport. Registered as an auxiliary transport ship in the Sasebo Naval District. The IJN simply calls her RIO MARU. Completes conversion that includes installation of two 25-mm Type 96 dual AA guns, signal equipment and new accommodation spaces. Departs Sasebo for the South China coast. Registered as a prospective submarine tender in the Sasebo Naval District. Captain Murase Raiji (38) (former CO of MATSUKAZE) is appointed CO.
Banshu, Hyogo. Begins conversion at Harima's shipyard. Four 5.9-inch (150-mm) guns, a range finder and an anti-magnetic mine degaussing coil are fitted. A torpedo and depth charge hangar is constructed as are replenishment goods storage and a medical facility. Motor launch loading equipment is also installed. Sasebo. RIO MARU is a tender in Rear Admiral (later Vice Admiral), the Marquis, Daigo Tadashige's (40) (former CO of KINU) SubRon 5 with light cruiser YURA (F), SubDiv 28 (I-59, I-60), SubDiv 29 (I-62, I-64) and SubDiv 30 (I-65, I-66). Departs Sasebo for Palau with the YURA and SubDivs 29 and 30. Enroute, SubRon 5 is diverted to Samah, Hainan Island, China. RIO MARU arrives at Camranh Bay, Indochina. That same day, Japanese forces land on the Kra Isthmus of Thailand and NE Malaya. Kure. Seven coils are fitted all around the ship's side for magnetic mine degaussing. Arrives at Singora, Malaya and disembarks personnel and equipment of the 11th Submarine Base Unit. Later, steams to Kota Bharu, Malaya, then Brunei, Borneo. Sasebo. RIO MARU is in SubRon 5 with SubDiv 19 (I-56, I-57, I-58), SubDiv 28 (I-59, I-62) and SubDiv 30 (I-64, I-65, I-66). Captain-Retired (later Rear Admiral) Ohashi Tatsuo (40) (former CO of RO-68) assumes command. RIO MARU is assigned to Vice Admiral, the Marquis, Komatsu Teruhisa’s (37) (former CO of NACHI) Advance (Submarine) Force’s (Sixth Fleet). She is designated flagship and tender of Rear Admiral (later Vice Admiral) Kawano Chimaki’s SubRon 3 consisting of SubDivs 13, 19 and 30 based at Kwajalein. Balabac Strait, N of Borneo. LtCdr (later Rear Admiral) Chester C. Smith's (USNA ’25) USS SWORDFISH (SS-193) operating from Fremantle, Australia, is patrolling the Strait. Smith’s lookouts spot a small convoy and he sets up for a submerged night attack. Smith fires two Mark 14 steam torpedoes at what he identifies at a “5,000-ton” oiler, but claims no hits. Actually, one of his torpedoes hits RIO MARU and rips open a 46-foot long by 26-foot wide hole in Hold No. 1. Smith then attacks another ship in the convoy and fires two torpedoes at it. He hits and sinks IJA transport TATSUFUKU MARU with the loss of 12 crewmen and 36 troops. Singapore. RIO MARU is drydocked and repaired at Seletar's No. 1 Shipyard (former King George V Graving Dock). Surabaya. Provisioned by auxiliary storeship HAKUREI MARU. Reassigned to Vice Admiral Takahashi Ibo's (36) (former Co of KIRISHIMA) Southwest Area Fleet as a tender for flagship I-8 and SubDiv 30 (I-162, I-163, I-166). 94 miles E of Camranh, Indochina. RIO MARU is attacked by LtCdr (later Rear Admiral) James C. Dempsey's (USNA ’31) (former CO of USS S-37) USS SPEARFISH (SS-190). Dempsey later claims two hits of four torpedoes he fires in a submerged night attack. He departs thinking the stopped ship is sinking by the stern. The next day, Captain Ohashi reports RIO MARU suffered "medium" damage, but is able to proceed to Hong Kong for repairs. Replenishes SubDiv 30 and departs Camranh Bay later that day. Proceeds to Singapore with repair ship YAMABIKO MARU and undergoes more permanent repairs. Attached to SubRon 5 with SubDiv 19. Surabaya, Java. Continues service as a tender in the Southwest Area Fleet's SubDiv 30 (1-162, 1-165, 1-166). Employed in transporting air field construction materials to Kokas on the Bay of Sekar, W Java. Ambon, Moluccas. Attacked unsuccessfully by aircraft. Assigned to the Second Southern Expeditionary Fleet of the Southwest Area Fleet. Departs Java for Ambon carrying 200 Allied POWs. At Surabaya provisioned by auxiliary storeship HAKUREI MARU. Loads drums and cargo for Balikpapan, Borneo. RIO MARU is scheduled to carry 5,000 drums of AvGas to Yokosuka. At Sorong, Vogelkop Peninsula, New Guinea. Minelayer WAKATAKA escorts RIO MARU through Dampier Strait as far as the easternmost tip of Waigeo Island. That same day, Captain Ohashi is designated the Supervisor of Modification. RIO MARU is rerated an auxiliary transport in the Sasebo Naval District. Departs Macassar, Celebes for Batavia (Jakarta), Java carrying 200 Allied POWs. Departs Surabaya escorted by minesweeper W-8 until following day. At 0900, departs Surabaya at 11 knots with oiler KAMOI escorted by minesweeper W-8 as far as the Banka Straits. At 1600, arrives off Horsburgh Light near Singapore. Departs Singapore for Cap St. Jacques, Indochina. Arrives at Cap St. Jacques. Arrives at Takao, Formosa in convoy with NICHIRAN MARU. Recalled Captain-Retired Kanemasu Yoshio (40) (former CO of OI) is posted as Supervisor of Modification. Captain Ohashi is reassigned to the Kure Naval District. Departs Osaka. Arrives at the Aioi Shipyard. Begins modifications of a unknown nature, possibly installation of Type 96 25mm AA machine guns and search radar as carried out at Aioi on other sub tenders. Departs Aioi at 0700 for Miike. Captain Kanemasu is the CO. Completes modifications. Arrives at Kure Naval Arsenal. Loads thousands of rounds of various sizes of ammunition destined for light cruiser AGANO that is undergoing repairs at Truk by repair ship AKASHI. Departs Kure. Arrives at Kobe. Arrives at Yokosuka. Loads a cargo of depth charges, coastal defense guns, foodstuffs and mail for transport. At 1600 departs Yokosuka escorted by YUZUKI. Vice Admiral (later Admiral) Marc A. Mitscher’s (USNA ’10) Task Force 58's five fleet carriers and four light carriers, supported by six battleships, ten cruisers and 28 destroyers, launch air attacks on airfields, shore installations and ships in the lagoon. Mitscher launches 30 strikes of at least 150 aircraft each. Beginning at dawn, the strikes are launched about every hour for two days. East of Uman Island. Anchored RIO DE JANEIRO MARU is hit by 1,000-lb. bombs during TF 58's first attacks, probably dropped by SBDs of USS YORKTOWN (CV-10) and SB2Cs of USS BUNKER HILL (CV-17). Captain Kanemasu is KIA. He is promoted Rear Admiral, posthumously. 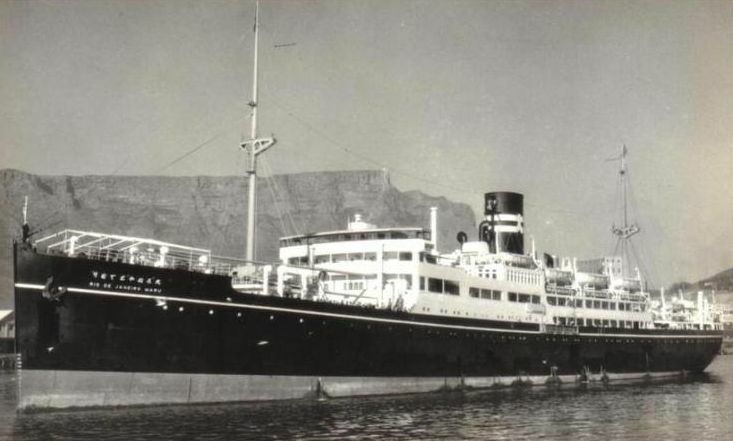 At 0030, RIO DE JANEIRO MARU sinks with the loss of two crewmen. She comes to rest on her starboard side at depth of 115 feet. Task Force 58 sinks 31 transports and 10 naval vessels (two cruisers, four destroyers and four auxiliary vessels), destroys nearly 200 aircraft and damages severely about 100 more. Truk is eliminated as a major fleet anchorage for the IJN. Three quarters of all Japanese prewar immigrants to Brazil arrived between 1925 and 1935, when Japan was preparing for its military and territorial expansion in East Asia. In 1933, immigrants from Japan numbered 24,494 or 53.2 percent of all immigrants entering Brazil that year. Most hoped to return home when they had made enough money as plantation workers to start over in Japan. Often, they were not paid the agreed upon wages and living and working conditions were far worse than expected. They were forced to buy their food and other supplies at exorbitant prices at stores owned by plantation owners. In the late 1930s, the number of Japanese immigrants to Brazil sharply declined as Japanese emigration headed to Manchuria, China, and Korea. Many books and Orders of Battle (OOB) erroneously list RIO DE JANEIRO MARU as being at Kwajalein during the Battle of Midway. Because of the conditions Allied POWs had to endure aboard her, RIO DE JANEIRO MARU was considered a "Hell Ship." Thanks go to Toda Gengoro of Japan for information in Revision 2. Thanks also go to Gilbert Casse of France.